What Does a Wedding Ring Mean in Other Cultures? Love may be a universal language, but wedding and marriage rituals are as diverse as humanity. Elsewhere in the world, a plethora of customs are uniquely expressed by rings that hold cultural value and signify important traditions. Let’s take a look at some fascinating examples of what wedding rings mean in other cultures. Hieroglyphics show Egyptian brides wearing wedding rings almost 5,000 years ago. Early rings were made from braided hemp or reeds, then bone, leather and ivory. As the Egyptian society advanced and became more proficient with metallurgy, rings were made from silver or gold wire. To the Egyptians, the circle was a symbol of eternity, and when spouses exchanged rings, they signified their eternal love. 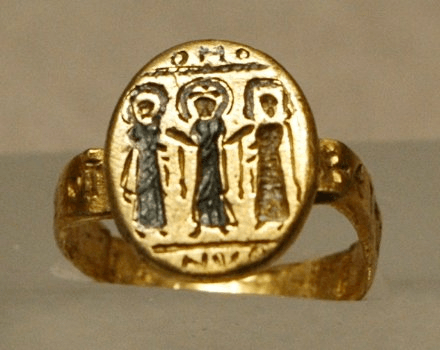 Byzantium Wedding Ring, 7th century A.D. Photo courtesy of Wikimedia. © Jastrow (2005). Ancient Romans were also known to exchange rings. These rings, also made of precious metals, were associated with wealth and the exchange of a marital dowry. As Christianity was adopted throughout the Empire, the “promise” to be married also became associated with a promise to remain virtuous and faithful. Often times the rings would be inscribed with the image of Christ joining the couple together in marriage (pictured above). In the 16th and 17th centuries, weddings rings came in the form of gimmel rings. Early versions of these rings date back to 1300, but they rose to popularity during the Elizabethan era, where they were also known as joint-rings. 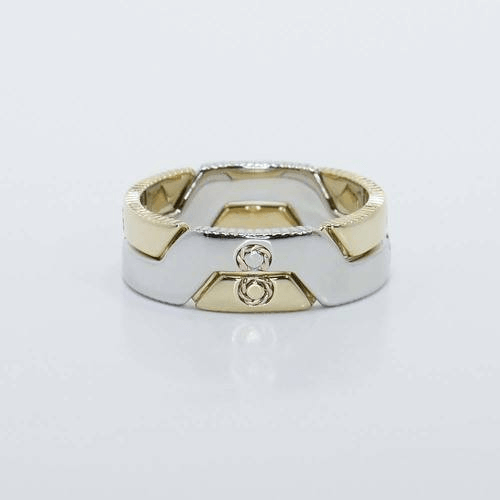 These rings feature two or three bands than can fit together to form one complete ring. They were used as both engagement and wedding rings: each couple would wear one of the bands during the course of their betrothal. If there was a third ring, it would be worn by a third person who would act as “witness” for the betrothal and marriage, and the rings would be combined once the couple exchanged vows. At this point, the complete wedding ring would be worn by the woman. The meaning of the gimmel wedding ring is full of symbolism related to love and commitment. Norwegians don’t just celebrate getting married with rings on their fingers. 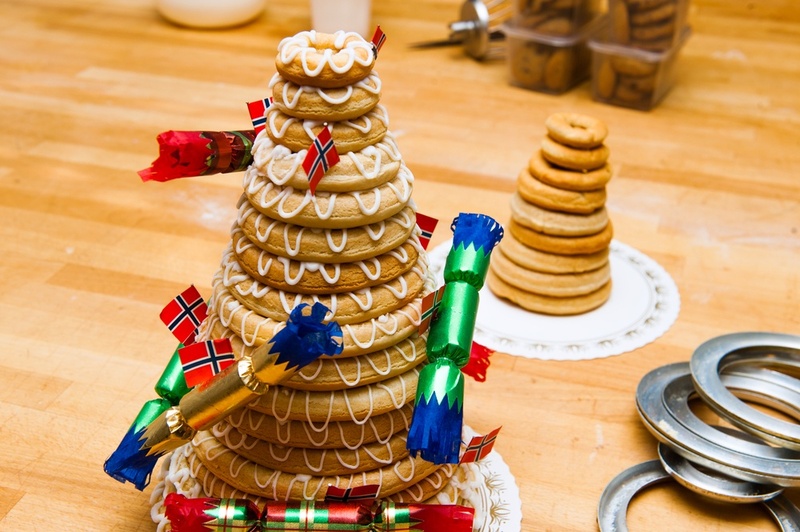 They also have rings on their dessert plates, in the form of a kransekake, a tower of iced almond cake rings. Sometimes they even build the tower of tasty rings around a wine bottle. Once you’re done with the cake, wash it down with a nice cup of sweet berry wine! Norwegians also have conventional engagement and wedding rings worn on the finger. But as with their Scandinavian neighbors, men get an engagement band just like the women. Scandinavians aren’t the only ones who have engagement rings for both genders. In Chile, men and women give one another engagement rings and wear them on their right hands. As part of the marriage ceremony, they take the rings off their right hands and put them on their left. Engagement rings aren’t just worn on the right and left hand. In Hindu culture, men give women engagement toe rings. These special toe rings are called “bichiya.” Today, many Hindus give their brides-to-be a traditional toe ring as well as a Western-style engagement ring. Exchanging wedding rings was not a custom in Japan until very recently. In a traditional Shinto wedding, brides and grooms would each exchange three sips of sake during the ceremony, not rings. It wasn’t until the 1990s that Western-style weddings and the wedding ring tradition grew popular. Modern Japanese ceremonies mimic the Christian rites, despite most of mainstream society affiliating as nonreligious—the focus instead remains on the romance. Closer to home, Native Americans have a diverse array of customs and rituals associated with marriage. Tribes that use or have adopted rings as part of wedding ceremonies tend to rely on materials that are rich with cultural meaning. For example, rings frequently use silver for the band and include semi-precious stones or natural materials such as turquoise, red coral and shells. 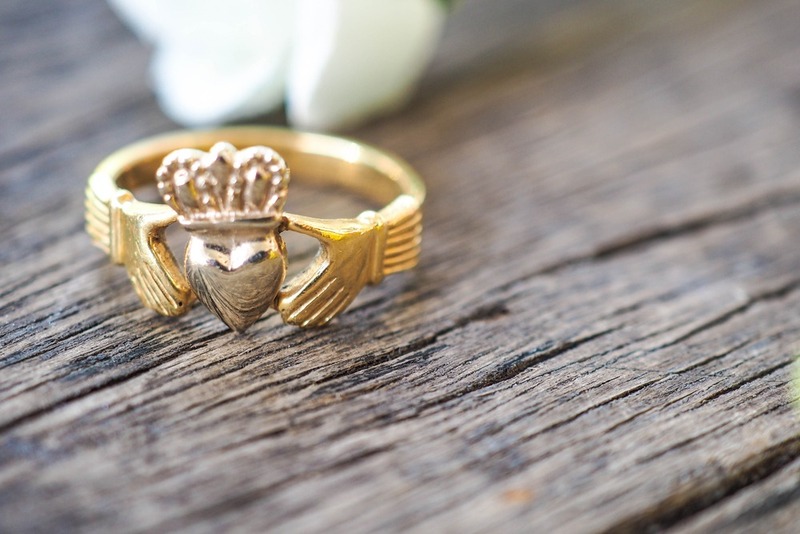 The Claddagh symbol, which symbolises marital fidelity, looks like a heart held by two hands and topped with a crown. It comes from Celtic traditions and is often used in Ireland and Scotland. 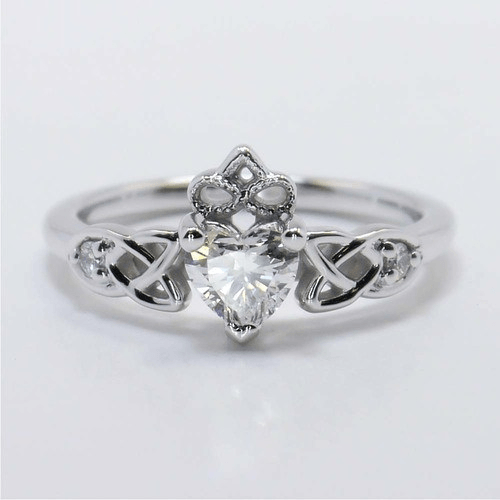 For engagement, a Claddagh ring is worn on the left hand with the crown pointing toward the wearer. Part of the marriage ritual is removing the ring and putting it back on with the crown pointed away from the wearer. French wedding rings often have three multi-coloured, interwoven bands. In many cases, the French prefer rubies, emeralds, or sapphires on their wedding rings instead of diamonds. Engagement and wedding rings are far from a modern invention. Their origins stretch back thousands of years and have evolved over time through contact with dozens of cultures, customs, and traditions. Hopefully, the variety of ring decorations and customs discussed here have inspired you as you search for your meaningful wedding rings.